My excuse this week? It was a Bank Holiday yesterday which means I totally lost the fact that it was Monday! But it was a wonderful weekend in my neck of the woods and this is my inspiration for this week. I would like you to be inspired by weddings! 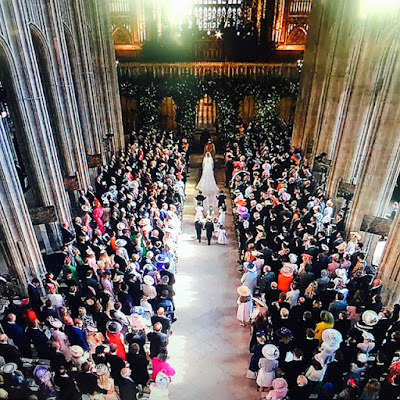 Yes, it was the "Royal Wedding of the Year" last Saturday. Now, that might not be such a big deal for you but it was a huge thing for this fan of all things royal and I blocked the whole day in my diary to spend hours in front of the TV with champagne, scones and Coronation Chicken. Loved it! Of course you can take this prompt in your own wedding direction. That of your children, a vintage layout featuring parents, grandparents or even older ancestors? Maybe you have a wedding themed collection of papers that you would just love to use - a nuptial layout or not. Perhaps comparing your own wedding with the dreams of you childhood self. A wish-filled future wedding maybe? Or just a bringing together of two things that are destined to be. Several directions to go this week.